This chapter contains the experiments of four tasks, i.e., general recommendation, context-aware recommendation, latent collaborative retrieval, and click-through rate prediction. 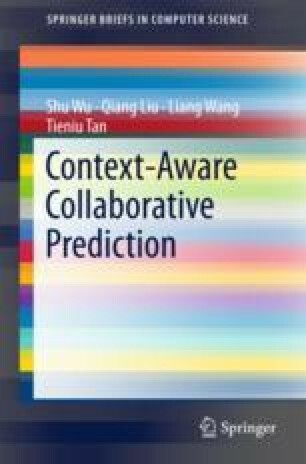 At first, this chapter describes the representative methods of collaborative prediction, context-aware collaborative prediction, and context-aware sequential recommendation. Then, it shows the experimental settings including the datasets and evaluation metrics. The experimental results on real datasets show that COT, HIR, and CA-RNN, respectively, outperform the state-of-the-art methods of context-aware collaborative prediction and context-aware sequential prediction. In addition, in context-aware recommendation and latent collaborative retrieval, we analyze the impact of the dimensionality of latent representations and examine the interacting order of entities. The convergence performance, the scalability, and impact of parameters are also analyzed. Last but not the least, we visualize the representations in latent collaborative retrieval and find some interesting observations on context representations and context weights. Parts of this chapter is reprinted from [1, 2, 3], with permission from IEEE, ACM, and AAAI.